Make way for these trays! JAM Paper's Stackable Paper Trays are the perfect organizational tool for your desk. Our letter trays sport a unique design that is sure to make your office pop! Buy two or more for savings and stack them up high! 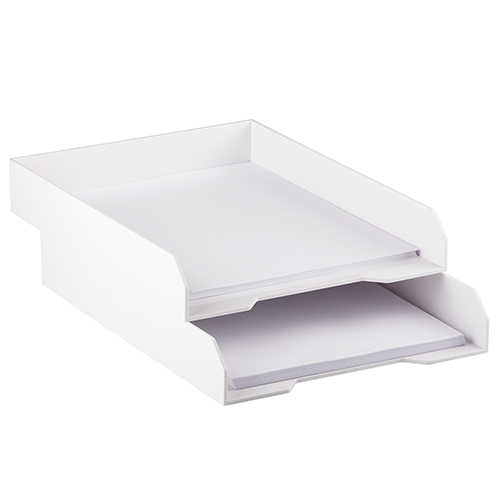 Stackable Paper Trays can hold up to 300 sheets of letter size paper each. Stack them high and get yourself all the paper storage you could ever need. Multiple trays are great for sorting and organizing your most important documents! Offset these trays in their stack for a truly unique look! Paper Letter trays are currently available in White! Never worry about your papers getting lost in the mess again!